I bought a bunch of toresetsu but eventually stopped because they're a bit useless. Should've bought a stack of Ibaras I guess. Oh wait, people buy games with paper for $8000 and even offer more. Mate, that's just nuts though. These were $25 each sealed from rancor just a year ago. I'm sure there are loads of these floating about. So far it's just two proxy bidders raising the price over and over again. Thought about bidding, but it's cheaper to just buy the real kit art! When a few collectors are actively hunting for a niche item you can see its price go really high in an auction, but after another auction or two, you'll usually find the price goes back down to a more realistic level. Case in point: I saw a mint Deathsmiles 2 artset go for about 27k yen a few months ago, and then a few weeks ago one in similar condition went for 9,900 yen. The one good thing about this Ibara auction is it may make others with an Ibara toresetsu put it up for auction soon on YAJ, once they see how high it goes (but, I suspect it won't go so high in subsequent auctions, as there are probably only a handful of people on this planet willing to pay over 20k yen for it). There are probably only a handful of people on this planet willing to pay over $27 for it). Anyone else sense a bit of sadness from that collector's posts? I wonder what made him sell them. Nah, he seems cool with selling (https://twitter.com/bentouya/status/1035661342785466368). He said he "thought it was better to pass them on to someone else". I guess he doesn't play them anymore. He said the only two he's a bit sad about letting go of are Mushihimesama and DDP DOJ WL. Yeah, seems to be cool with letting them go. Tried to translate some of his tweets, and he wrote something about trouble insuring 4 000 000 JPY worth of PCB:s when shipped. Could be around those figures that they paid him I guess. 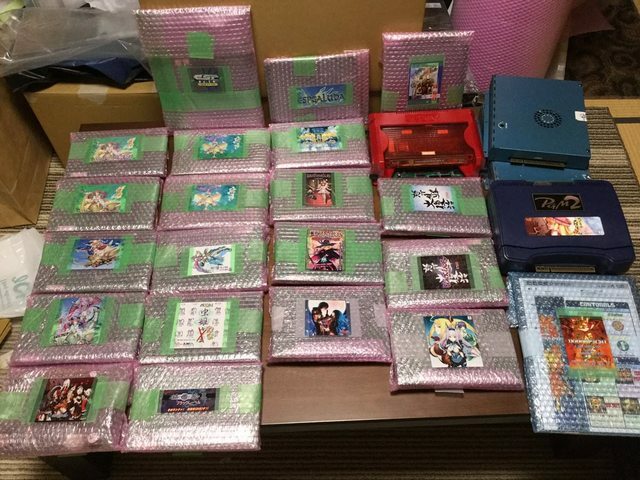 He was thinking about selling everything at Yahoo Japan, but thought it would be too much of a hassle with fees and individual shipping, so he sent everything to Surgaya in one shipment instead. He seemed kind of nervous when it had gone 10 days without any update from Surugaya regarding his parcels though! Buyer didn't pay, so it was relisted. Hasn't closed yet.